How you start the day is important don’t you think? For me, I stumble out of bed just after 6 am, fetch the dog leads and get out onto the quiet streets of Dubai with my two Border Terriers. At this time of year I watch the sunrise and by the time I’ve got to the beach the early morning light is fantastic. My route takes me along the back of a dhow building yard and as I turn the corner I see the full sweep of a white sand beach with the Burj Al Arab at the end of it. The clean lines of this hotel, built in a the shape of a dhow sail, still makes me stare. The colour of the sea and sky reflects over its curves and at night it’s a kaleidoscope of colour and lights. 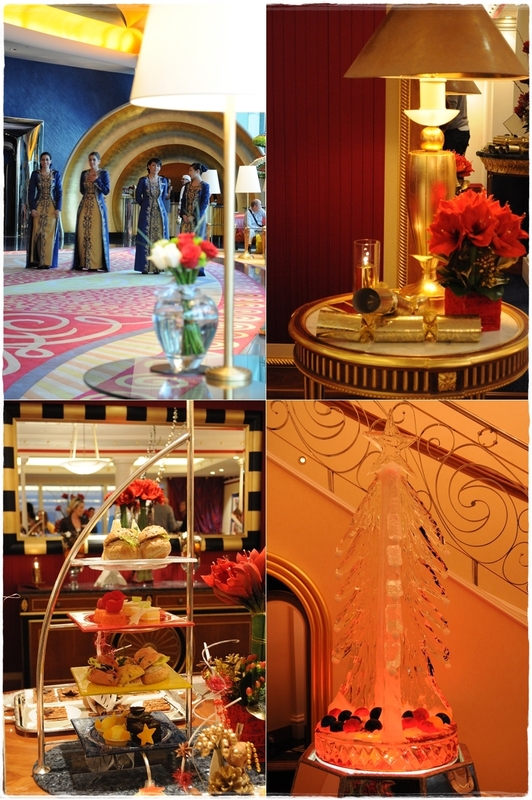 Even though I’ve booked for many house-guests to visit, it’s many years since I went inside the hotel itself, so an invite to preview the Burj Al Arab’s Taste of Festive left me rather excited. Checking in with security, parting the waves of tourists furiously clicking their cameras to drive under the barrier and over the bridge to the little man-made island feels like you are entering another world albeit of privilege and luxury. I received a warm welcome with cold towels, dates and coffee and five minutes of people watching informed me that the Chinese are in town en masse and wanting to experience the best that Dubai dirhams can offer. “Is it a very good restaurant?” one man demanded of his tour guide. The shock of the contrast between the minimalist exterior and the interior hasn’t diminished. Huge fish tanks flank the escalators, dancing fountains leap, the blue, red and yellow colours are reflected in the myriad of gold surfaces from the lifts, to the lamps, to the braid on the staff uniforms, under the towering 180 metre atrium. It truly is like being inside an enormous Christmas decoration all year round. The completely over-the-top wow factor has diminished somewhat because when I first visited there was nothing that compared to its lavishness. Dubai now has an array of jaw-droppingly over-the-top interiors. The Burj Al Arab, when it opened in 1999, led the way and remains dedicated to gold-plated luxury with every room being two-storey, personal butlers and a fleet of Rolls-Royces. One of the suites had been transformed into a festive venue with Christmas tree ice sculpture, poinsettia, bubbling globes of Christmas scent and, of course, festive food and drink. A Santa’s Dream mocktail (Dubai has a zero-tolerance policy to drink driving) a refreshing drink of fresh strawberries and milk slipped down, although I was eyeing up the Jingle Bell, a ‘berry explosion’ (hiding rum I think) with a slice of star fruit on the side. 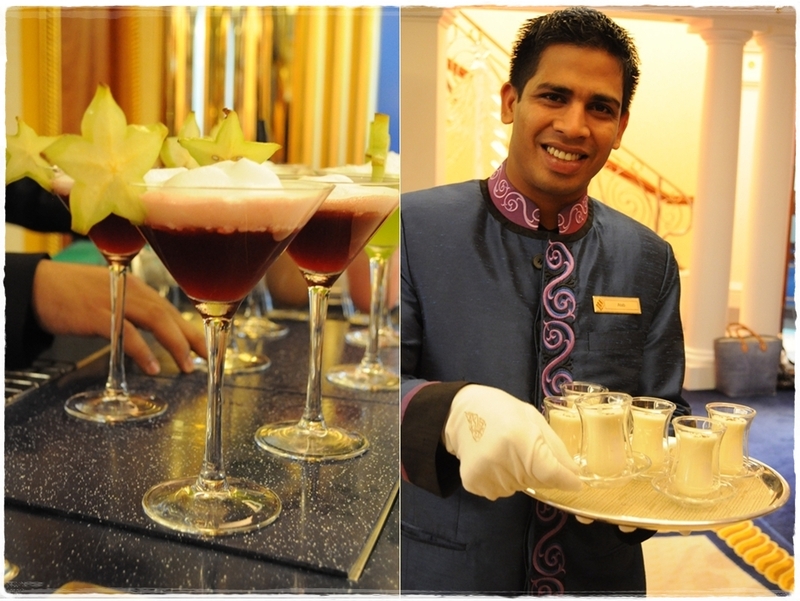 These were made by the ‘mixologists’ from the festive cocktail range served in the Sahn Eddar Lounge and Skyview Bar. Resisting the courteous staff plying mulled wine and egg nog, but sampling a range of Christmas biscuits, gingerbread, mince pies and chocolate truffles, I then decided that a taxi home was advisable as a glass of Champagne was handed to me to toast the arrival of the limited edition Burj Al Arab Christmas log. 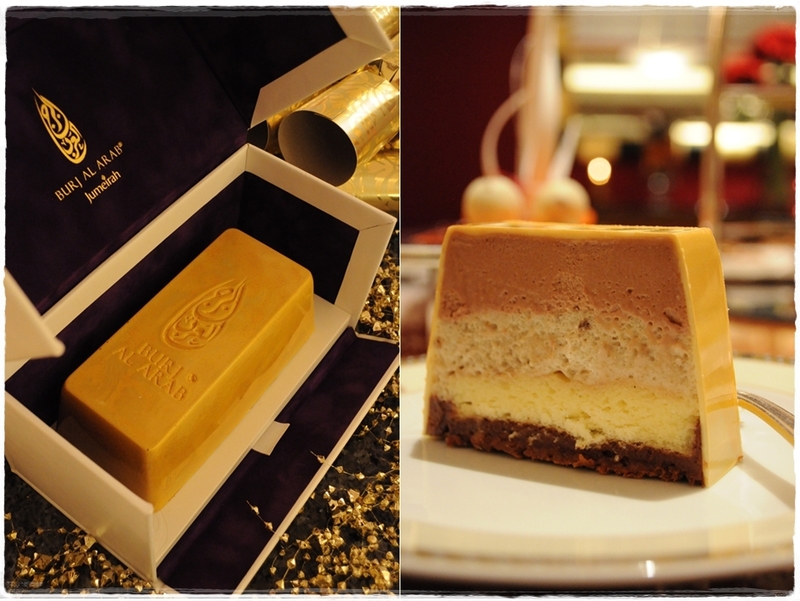 Layers of chocolate cream, Tahitian vanilla, banana extract, guanduja, dark chocolate, and praline covered in white chocolate and edible gold dust were formed into a monogrammed gold bar. It took months to perfect and the chocolate mold is patented; as a statement gift it takes some beating (500 AED, limited quantities on sale from 11th December). All this luxury comes at a price and if you want to stay at the Burj Al Arab for four nights over Christmas expect to pay from AED 8990 ++ (2448 USD) per night. The firework display on New Year’s Eve is absolutely stunning – to experience it in this prime location commencing with Champagne at 6.30 pm, a gala dinner in a choice of the Burj Al Arab restaurants, with other entertainment to take you up to midnight and beyond is a cool AED 7450 per person. As the venue for a Christmas treat, especially if you live in Dubai and have visitors, there are more affordable options from afternoon tea to Christmas cocktails at the Skyview bar. Dining on the beach at the Majlis Al Bahar really appeals to me – the Christmas Eve barbecue is AED 395 per person. A lavish Festive season brochure, which you can pick up from the hotel, has all the details or check the website. I couldn’t resist leaning over the top most balcony to take a picture of the doll’s house sized furniture in the lobby and the fountains which were lit up in multi-colours for night-time. The entrance was a flurry of arrivals, everyone looked expensive – there was a lot of gold. My favourite view of the Burj Al Arab remains its curved exterior across the sands, however I was reminded to take the short journey across the water to experience this iconic building from the inside more often. 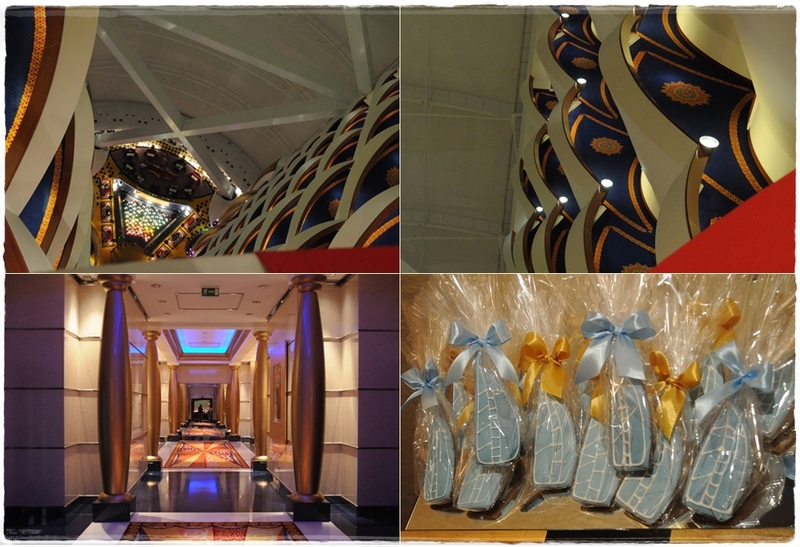 Disclosure: I was a guest of the Burj Al Arab for the Taste of Festivities event. Posts have been a bit thin on the ground and I haven’t replied to comments as quickly as usual due to a bout of bronchitis. Normal service resumes soon, enshallah (as they say in the UAE). Where is your favourite location for a cocktail? Wow – lavish indeed. Great pictures Sally! Wow, Sally, what a post! It looks like an amazing hotel. 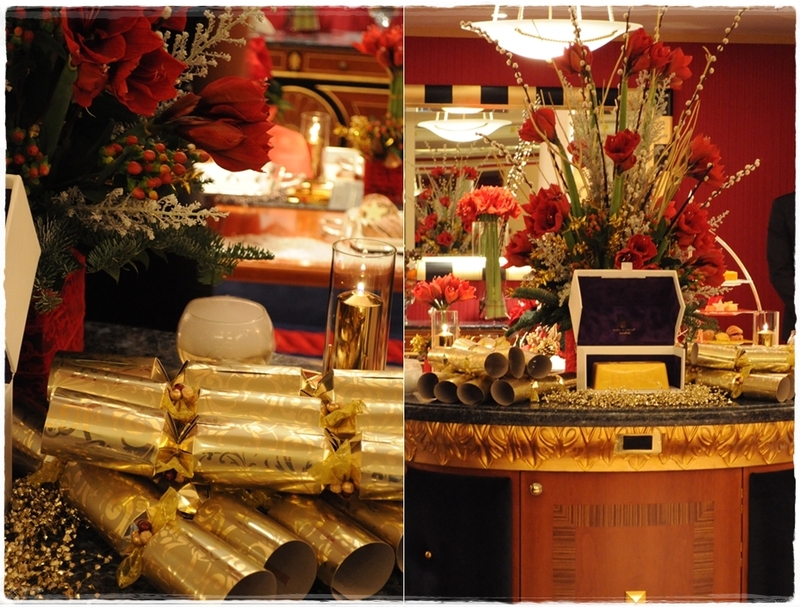 I love opulent hotels at Christmas, they’re always so glorious! Wonderfully written and everything feels so fairytale-y and alive! I felt like I’ve been there too and tasted everything! Thank you for letting us experience these wonders through your eyes! Sally, your post has done the trick of enticing me once again to Dubai! I would never have considered visiting at this time of year, but it seems they do Christmas very well indeed! 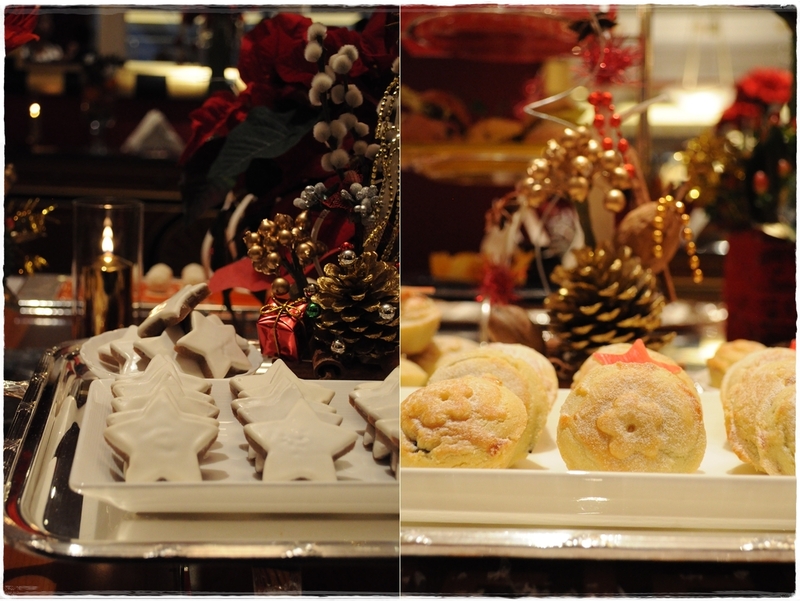 I love all the festive decorations and chocolate covered biscuits. 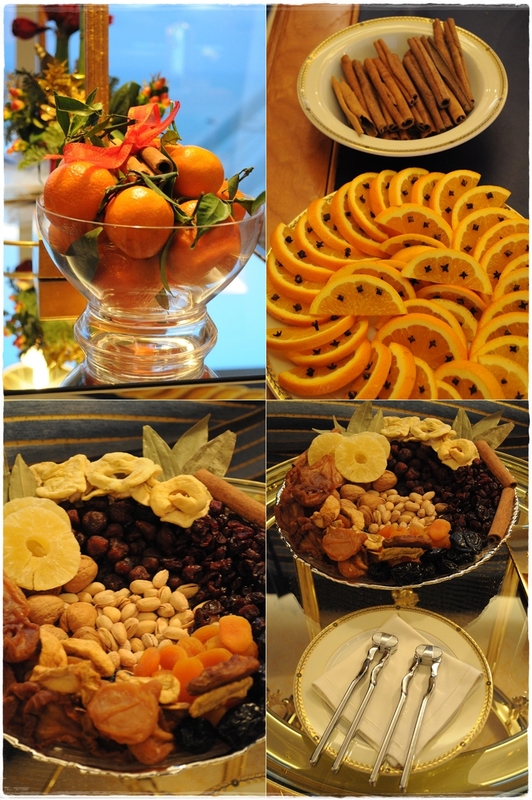 The mixed fruits and nuts have also given me an idea for a Christmas centrepiece! 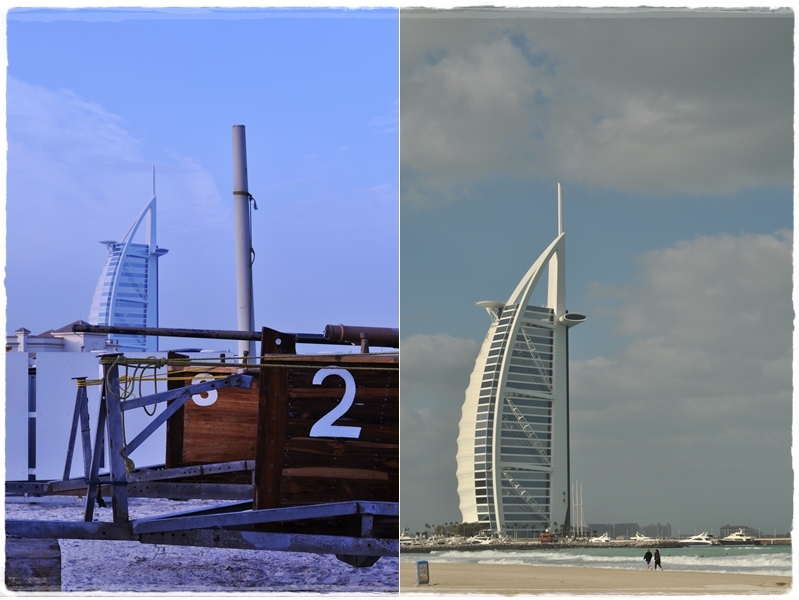 We did visit the Burj al Arab when we stayed at the Al Qasr on honeymoon, so it was nice to go back virtually! We felt truly posh when the mixologist came to visit our table to make customised cocktails and that experience is hard to beat! 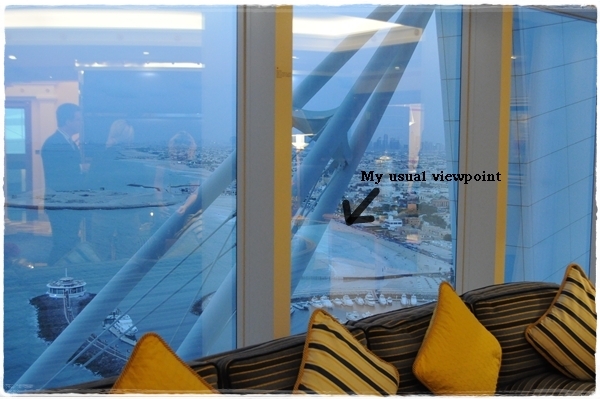 Thanks so much for this inside view of the Burj, it has been years since my last visit as well. Beautiful writiing and awe inspiring descriptions. It is an almost sureal experience. Best wishes for the holidays and I hope to meet you again some time-inshallah. Forgot to leave the name of my little food blog, in case anyone else is interested. Faiza Loves Food on FB. Thanks. Sorry to hear you’ve been unwell. I bet an invitation to visit the Burj al Arab perked you up no end 😀 It’s a bit too glitzy for me (I’m a log fire/chalet kind of girl this time of year) but I appreciate the intensive attention to detail. Stunned by the yule log. Wow! Thanks for the peek inside, and the lovely description of your early-morning dog walking route.. Thanks for sharing! I really beautiful place and view. Spectacular…and such attention to detail. Thanks for sharing with the poor folks :). I had a high tea at the Burj a few years ago. Over the top. I was sorry to have missed this event. Glad you were able to share with us 🙂 I do love the Burj’s Majlis Al Bahar for a beachfront lunch or dinner. As for cocktails, the Jetty at the One & Only Royal Mirage, or Neos, the top floor bar at The Address Downtown Dubai overlooking the fountains. It all looks beyond luxurious. Great photos. Hope you are fully recovered from your bronchitis. Sally… love the way you wrote about the morning walk- Dubai can be pretty special! And a dhow building yard in Jumeirah? Hope you are feeling better, Sally! It’s THAT time of year, for sure. Thanks for the tour of such splendor! And what fun for you… What a surreal reality just out your door. In the almost 7 years in Dubai I have never been to the Burj. It is on my to do list for the very near future. I’ve always fancied High Tea there…. Wow, this is absolutely beautiful!! Oh my goodness. Truely you live in paradise! Your posts always make me feel as if I am there, experiencing it with you. Thank you for another fantastic peek into your world Sally!! Sorry to hear you have been poorly. (I am a bit behind on reading posts!) What a view to have on your dog walk. It’s funny to think of you living somewhere so utterly different to rainy old blighty when we share so many of the same ‘online’ experiences. The hotel looks just incredible and I find it amazing that there are enough people with enough money to take advantage of it’s splendours. I would love to see it. yikes – that looks amazing! What a stunning insight you’ve shared here. There’s not much chance that I’ll ever be visiting this palatial abode but loved seeing it through your eyes. The fact that you shared your usual morning perspective and then the view from inside was precious. Thank you and hoping that by the time you read this you’re feeling A#1. I’m joining you from Post of the Month HH UK and your photography is gorgeous. I have never been to Dubai but it looks so fantastic. Thanks for sharing you beautiful images and thoughts.